Fabio Cintioli is full professor at the "Università degli studi internazionali di Roma (UNINT)" and leads the boutique firm Cintioli & Associati, which has been awarded as best Italian Administrative Law firm in 2017 e 2018 by TopLegal. The firm was founded in 2012 and focuses on Administrative Law and Administrative Law Litigation, as well as on Regulation and Antitrust. He was Ordinary Judge and Judge of the Administrative Regional Tribunal from 1992 until 1998, member of the Council of State from 1998 until 2007, Legal Advisor to the President of Italian Senate from 2001 until 2005 and Secretary general of Italian Competition Authority from 2005 until 2007. He led the Administrative Law and Regulation Department of Bonelli Erede Pappalardo Law Firm from 2007 until 2012. 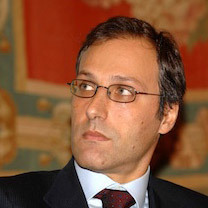 Among his academic publications and essays, can be mentioned "Giudice amministrativo, tecnica e mercato" (2005), "Potere regolamentare e sindacato giurisdizionale" (2007), "Istituzioni concorrenza e servizio pubblico" (2010), "Giusto processo, CEDU e sanzioni antitrust" (2015).